All people who want to participate must put 10-15 euros (for a hole year so he has the right to participate in all contest inside this year). this money is going to help to pay the Forum expenses. All month we celebrate these contest....choose the best work by theme...and the end of the year....the people choose the best one from the winners! We can do a pull, and let the people decide who is the winner! We can talk with Mithril.ie to show the "competition" in their web...and another forums.... to give more live to this project/Forum! We ended simplifing everything so it's actually free because there is not a prize and it is just about sharing and encouraging people around to paint a little bit. I am also wondering about the low levels of participation 6-8 people painting and maybe 10 voters... Should we share this idea over at the mithril forums/Michael? so maybe then we could reach a little bit more participation? It's free to participate, you just need to be a member of MMP. As always we demand to have a pic of the starting point (clean metal or just with primer on, or green stuff/putty visible), at least one picture more with the painting process started and then a final shot of the finished work. A thread for all participants will be opened in a couple of weeks for they to start posting their pictures and work. Once the deadline is reached a new thread with a voting poll will be opened for every member to participate. And there it goes! Who is in?? Edited: Adding and extending explanations of the contest mechanics. I shall seek out a Wraith!! I am in too ..... but only nazgul miniatures? Can be undeads too? My idea is try to paint M256 "Barrow wight Lord" miniature...but if can't be....I will choose a nazgul!!! @orc, Only Nazgûl admitted, in any of their forms. But your proposition gaves me an idea for another month... something about ghosts and skeletons!! C'mon join us and feel the fear and the cold of those nine condemned kings!! I have made my choice: I go for M349. I would like to participate with MS496 'Witch-King™ in his true form'. Yup gerold feel free to participate, since you are choosing a Nazgûl. The idea behind this nazgul thing is to practice black or dark colours and variations within those. This does not mean you could not paint the face in a spectral white-grey-green-blue, neither that you could paint focal points in brighter colours but you/we should stick to an overall dark scheme. On the other hand I did not get any answer from people around here about moving this league idea to the mithril forums (see post #53 and #54 a little bit upwards). So seeing how is doing this third league and because of the lack of interest/low participation I think I will move forward and try to organize something there with the hope to reach more people than on this beloved mmp pages. I understand how you feel Master Maenas. I still want to keep,painting as this monthly deadline has put some move in my paintings. So I will follow you in this case, no matter the place. As Master Milo say I will keep painting by y self too no matter the place! Is this still happening? I've been a bit busy elsewhere of late with other projects, but if we are still on (all 4 or 5 of us ) I will select a suitable Nazgul and get cracking . I intend to paint my nazgul this week. I feel keep going is the only way. But I can not paint it black. The W-K in its true form should have a pale shiny color I think. 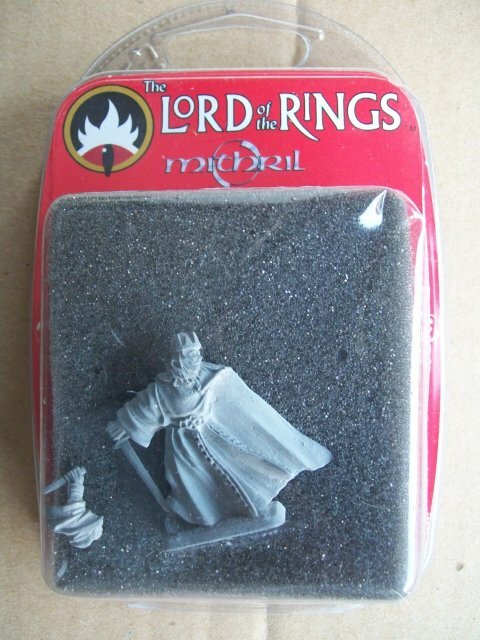 I am going to use the Nazgul figure from the SALUTE 'freebie' for this one. I will try and get a photo posted of it in its current unpainted condition . . . .you can choose a dwarf and give him a yellow colour scheme. Everything is ad absurdum here . . .
Master Thingol, I have few spare nazguls if needed.